Gardein is well-known for its delicious plant-based meat alternatives. From beefless tips and meatless meatballs to the company’s beloved chick’n tenders, Gardein products are a popular vegan substitute in many traditionally meaty recipes. Now the brand is rolling out a new line of individual-sized bowls—a frozen vegan lunch that’s ready in minutes. Busy schedules can often mean rushed, unsatisfying meals, but Gardein’s new bowls fit seamlessly into any lifestyle to make going meatless easy and delicious, anytime. The new Single Serve Bowls are perfect for everything from quick office lunches to sit down dinners and can be prepared in just minutes. 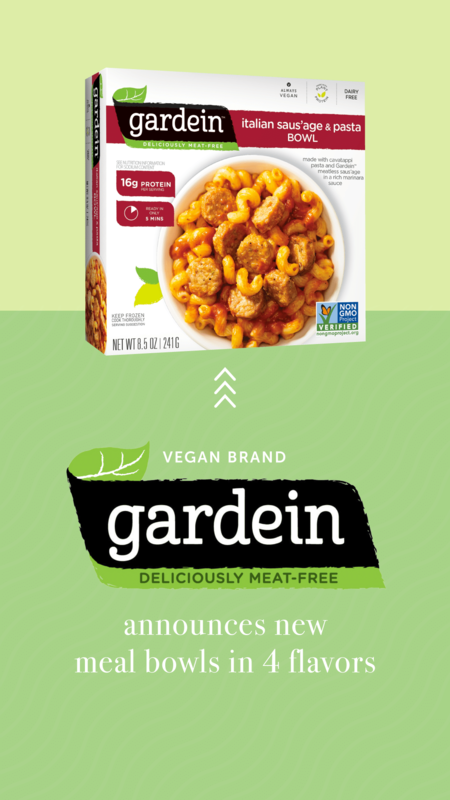 Like all Gardein products, Single Serve Bowls are Certified Vegan, made with 100 percent non-GMO ingredients and provide a good source of protein. Chick’n Fajita Bowl, made with Gardein chick’n, bell peppers, onions, black beans, and corn on a bed of rice. Italian Saus’age & Pasta Bowl, made with Gardein saus’age, cavatappi pasta, and a hearty marinara sauce. Orange Beefless Bowl, made with Gardein beefless strips, cauliflower, edamame, and red bell peppers in a spicy orange sauce. Teriyaki Chick’n Bowl, made with Gardein chick’n, broccoli, carrots, and red bell peppers over a bed of rice with a sweet teriyaki sauce. And this isn’t the only news from Gardein. The company also unveiled new vegan Breakfast Saus’age Patties—containing six grams of protein per serving and 75 percent less fat than pork sausage. We can’t wait to give these new options a try! These new offerings from Gardein aren’t surprising. Meat alternatives are more popular than ever. According to a new report from leading market research and consulting firm Coherent Market Insights, the global vegan meat market is set to surpass $6.5 billion by 2026. Fortunately, with all the great vegan meats and ready-made meals already at a store near you, there’s never been a better time to give meatless eating a try. To get free vegan recipes, easy meal ideas, and tips on making the switch, order a FREE Vegetarian Starter Guide today.